This week we are officially in our third year of homeschooling with My Father’s World Curriculum! It seems like a great time to share about our experience with last year’s curriculum, so here’s another My Father’s World review. This is basically a geography themed unit, although it covers history and science, as well. Exploring Countries and Cultures is geared for third to eighth graders. 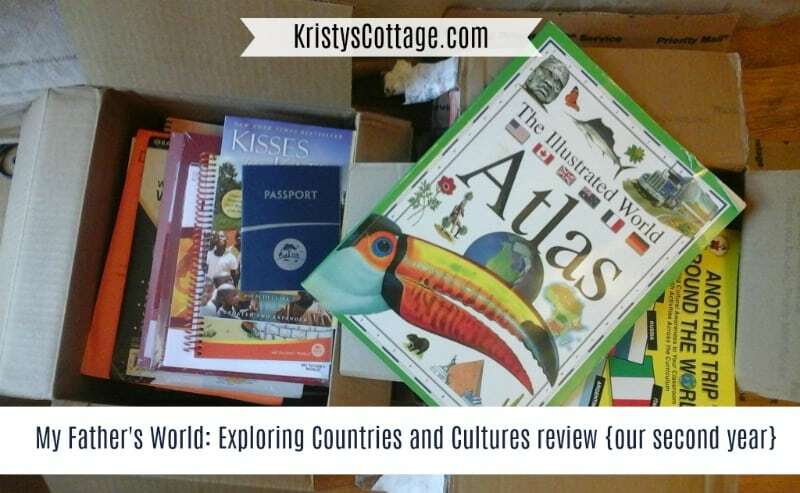 My older two children each had an “Exploring Countries and Cultures” geography notebook, which coordinated with the topics we were reading about on a particular day. 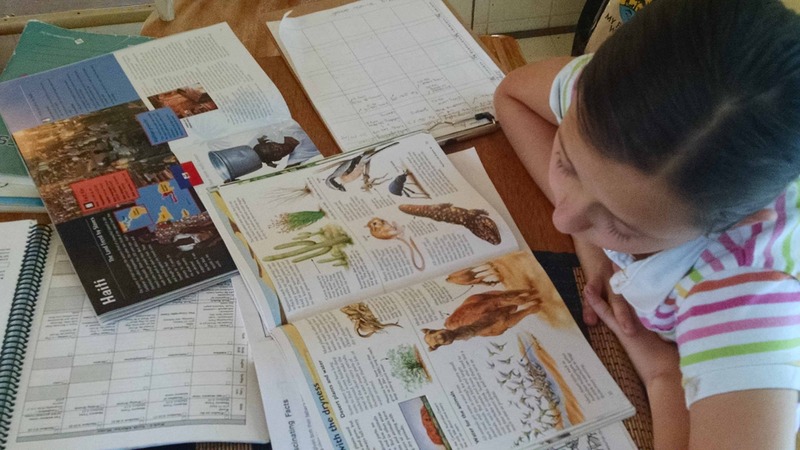 For older students (7th and 8th grade), you would simply add additional science, reading, and opt for the more advances projects in the curriculum. Younger students can also benefits from this unit; my four and six year olds simply listened in during the read aloud times and enjoyed the beautiful books! 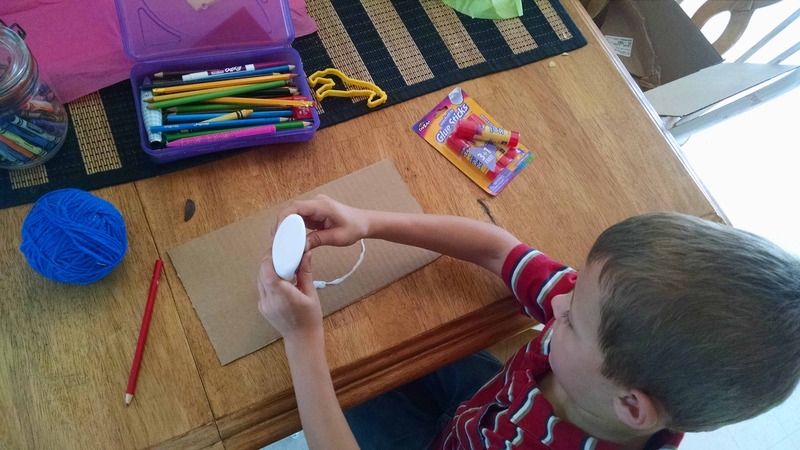 I didn’t use an art curriculum because my children do so many creative and artsy projects on their own every week that it didn’t seem necessary to “schedule” this subject. I do try to keep a supply of art supplies on hand for my kids to use: tape, glue, glitter, stickers, colored paper, drawing paper and pencils, colored pencils, play dough and clay, cardboard, lace and buttons. Occasionally, we used a craft idea from Global Art as an art project to fit with the theme of a particular culture we were learning about. Global Art is included in both the Basic and Deluxe “Exploring Countries and Cultures” packages. Since this unit is geography-based, it was a fun variation from most “history” themes. We enjoyed lots of history throughout the year, but the spot light on culture, language, and nationalities was very engaging. My older kids (5th and 3rd grade) especially enjoyed filling out their passports as we “traveled” to different countries throughout the school year. The missionary biographies in this unit are the BEST we’ve ever found. I cannot recommend the Christian Heroes: Then and Now series, by Geoff and Janet Benge, highly enough! Speaking of books, our family loved the beautifully colored science books in this unit! MFW is a Charlotte Mason style curriculum, and one of the foundational tenets of Charlotte Mason methods is the generous use of “living books” as an integral part of education. I have always been a huge fan of the book selection in MFW curriculum sets, and this unit was no exception. As a home educator, I really appreciate the fact that MFW includes a teacher’s manual with each of their units! We use this lesson plan guide as a structure for our weekly school days, as well as our yearly homeschool schedule. I don’t use every idea or suggestion in the guide, but it definitely serves as a helpful tool in planning my own four-day school weeks/30-week school years. For me, Exploring Countries and Cultures felt like a very complicated unit at first. We were reading daily out of so many different books (2 or 3 pages here and there) that I felt scattered… and my book bag was huge! During the last few months of the school year, I simplified by doing all of the history readings on Tuesday, all of the science readings on Wednesday, etc. That worked so much better for us! MFW leaves a lot of room for flexibility and individuality, but it can be a struggle to keep up when your kids aren’t strong readers. 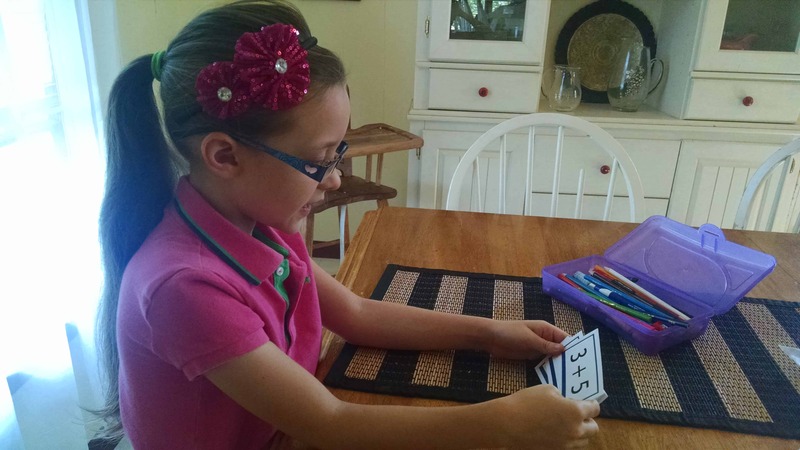 Since two of my children struggle with reading, homeschooling can feel very overwhelming most days. Keeping up with this unit was pretty tough, simply because I felt spread so thin having to coach my two kids who could handle very little independent work. The MFW family learning cycle units are very literature-based, which is something I love about this curriculum! However, it can also be daunting, since reading hasn’t come easily for two of my three school-aged children. Getting through a school day with this unit required a of hands on help from Mama, as well as a generous amount of tweaking the phonics, reading, and language arts portions of the curriculum. Over all, I would say that we enjoyed this unit very much and definitely recommend it to others who are looking for an eclectic, geography-based curriculum for primary and elementary aged children. In the weeks ahead, I hope to review MFW first grade and American history units, as well as share a little about homeschooling a preschooler and toddler with MFW early learning packages. If you’re looking for a review on MFW curricula, check out these posts. ECC was our most fun homeschool year ever! I can’t wait until we come back around to that one again for my little girls. We’ve just finished RTR, and will be doing Ex-1800s next year.